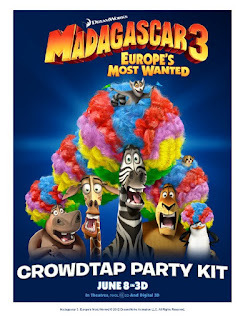 DISCLOSURE: I was selected by Crowdtap to host a party to promote the release of Madagascar 3: Europe's Most Wanted. Hosts were sent a digital party kit that included decorating ideas, games and activity sheets. All opinions are my own. The kit was really cute and had a lot of fun party ideas to build upon. I sent out an Evite and invited some of my daughter's friends from school, the neighbor's kids, my niece and nephews and some other people. Everyone was pretty excited. I also billed it as an End-Of-The-Year Party since school was ending pretty soon. Almost everyone invited agreed to come. To get ready for the party, I started making some of the decorations that were suggested in the party kit. They had paper chain templates for each of the main characters. I decided to go out and buy some animal-print cardstock to print on to make the paper chains a little sturdier. The templates printed out well on the back of the cardstock but they were so hard to cut out! Especially Melman. He had so many twists and turns to cut out and the card stock was pretty thick. But I managed to make a nice chain that I put over the entryway into our living room. Next, I worked on assembling the "Pin The Tail On Gloria" game that was included in the party kit. It had one page that you could print out with her top half and a tail and another page with her bottom half. I had the pages printed out at Office Depot since I didn't have a color printer. I also made a page of tails to print out so we could have more than one. I cut Gloria out and taped to her a piece of foam board. I think it came out pretty cute. But then disaster struck! The day before the party, I started feeling really sick. I was freezing, I had a fever and a cough and just felt like lying in bed. I slept on the couch almost the entire day, while my husband cleaned and vacuumed and tried to get things ready for the party. Numerous times he asked if I wanted to cancel, but I didn't want to. The 9th was the last day I was free to host the party and the 10th was the last day we were allowed to host the Madagascar parties. I had planned on making my cake and cupcakes the night before the party but I was just too sick. The next day, I was still feeling really crappy. The party was to start at 4 pm but I didn't crawl out of bed till after 8. I needed to get the cake started since I still had to have it cool and make the frosting and decorate the cake and cupcakes. I didn't have the energy to make it from scratch like I had originally planned and so I had my husband buy a box of Duncan Hines French Vanilla and Devil's Food Cake mixes. I mixed them up into separate bowls and then proceeded to pour about 1/4 cup of each alternating into a 9" round pan. But as I was doing so, I felt really faint and actually had to stop and lay on the kitchen floor. At that time, my husband told me stop torturing myself and just go upstairs and get in bed. He finished pouring the cake mix into the pan and then also made some vanilla and chocolate cupcakes for me. I even bought zebra-print cupcake liners! At that point, I decided we needed to go ahead and cancel the party. It was already 2:00 and we didn't really have any food ready, the cakes and cupcakes were unfrosted and I just wanted to sleep! My husband took charge of calling and texting all the guests. I had to cancel on 10 kids and their parents and other friends and family. I was so sad and worried. How was I supposed to write up my party report? What was I going to do with all the masks and activity sheets that I spent $30 on getting printed? My kids were super sad too. They had been looking forward to the party all week. My daughter was excited because two of her best friends were going to come. They were devastated when my husband told them we were going to cancel the party. But luckily, one parent didn't get the voice mail he left. So my daughter's friend showed up anyway right at 4:00. 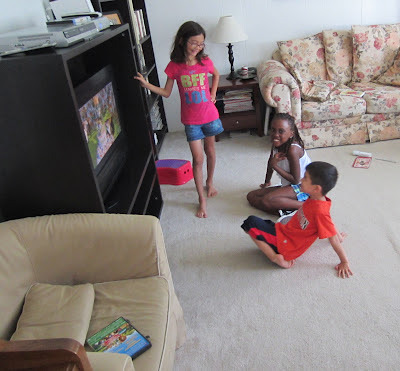 So they played on the Wii, watched Madagascar 2 and ate hot dogs, while I slept upstairs! The next day, I emailed Crowdtap to let them know what happened. Jennifer from Crowdtap said I could reschedule the party as long as I was able to get the report in by the due date. So, we decided just to make the best of it. Even if it was just my kids and adults wearing the Madagascar masks and getting our faces painted and coloring the activity sheets! The night before the rescheduled party, I made another zebra cake. This time from scratch using my regular yellow cake recipe. I divided it into two bowls and added about 3 tablespoons of cocoa powder to one of the bowls and then proceeded to make the zebra cake. I decided to make two 9" rounds and make a layer cake. I probably should have used the recipe though that came in the party kit. My batter was pretty thick and so it didn't spread out as well as I would have liked in the pans. Since I added cocoa powder to half of the batter, the chocolate batter was thicker than the other half. I didn't even bother taking a picture of the batter in the pans since it didn't come out too well. But here's a picture of them going into the oven. And here are the finished cakes cooling on the wire racks. Here are the stacked layers with the crumb coat before it went in the fridge. And tada! The finished cake. I had a few people call me the day before the party to tell me they were able to come, so yay there were going to be more than just my own kids at the party! (So, it actually turned out to be more than just the five people I wrote down in my Crowdtap report.) I set up an area outside in our patio for the Madagascar activities including the mazes, coloring pages, dot-to-dots and the masks. I set out scissors and crayons too for the kids to use. I also hung up the "Pin The Tail on Gloria" game outside in the patio. I made a fruit plate so the kids could have some healthy food. I made a Lemon Orzo Salad for the adults. We had some corn on the cob. We had some Kettle brand BBQ chips that everyone loved! My husband grilled some asparagus for the adults. And finally he also grilled some hot dogs and brats. The party was set to start at 2, but the first guests didn't arrive till almost 2:30. It was Grandma and Grandpa! They kind of felt bad since I told them there weren't going to be any other kids at the party. They were happy to come though. They got see their grandkids again and have cake! Next, came the neighbor's kids with their babysitter. They immediately went out to the back to go ahead and start coloring. After working on the coloring pages and activity sheets for a little bit, some of us moved to making the masks. The others wanted to wait for the face painting. Next, it was time to eat! We were all getting pretty hungry. The kids all sat together in the living room, while watching Nick Jr. My daughter and son changed into some dress up clothes sometime between coloring and eating! Here's my plate of food. Yum! I usually don't get to eat during parties that I host so this was a treat! But sadly, just as I was trying to finish up my last few bites, the kids came running back into the patio. My 1 year old had fallen asleep in his high chair in the patio so I didn't want them making a lot of noise. So, I suggested we go inside and I would paint their faces. I had bought a kit from Amazon (with gift cards from Crowdtap!) to use during the party. I didn't really have a set plan on what I was going to be painting. I just had the kids tell me what they wanted painted on their faces. The neighbor's son wanted to be a tiger. I think it turned out pretty good! My daughter wanted to be Gia the Jaguar. I didn't have a good picture to go from and my daughter wanted fangs added. Here's a picture of all the kids after getting their faces painted. Next, it was movie time. The kids sat down to watch the first Madagascar movie and ate popcorn. While the kids watched the movie, I went ahead and sliced the cake. My in-laws were going to be leaving soon and they wanted their cake! The zebra stripes didn't turn out as bad as I thought they would. My mother-in-law was pretty impressed and the kids thought it tasted good. This is how much we had left over once everyone got a slice. My friend's son really liked the cake. By the end he was eating with his hands! After cake, the kids wanted to go play the "Pin The Tail on Gloria" game. They each took turns but in the end, we just said they all won. All the kids had a great time at the party. They really enjoyed getting their faces painted, though when I asked my daughter what her favorite part of the party was, she said it was the activity sheets. When I asked my son, he liked the "Pin The Tail on Gloria" game. The party was a lot of fun and the kids loved getting the chance to play together with their friends. Thanks Crowdtap and Dreamworks Animation! Wow the cake turned out really well! Looks like all the kids had a lot of fun, great job! !